The international best seller got an overhaul. Increased stainless steel bearing count, a new extended handle and the powerful Carbon Matrix (TM) drag system make the CS Pro Rocket Black Edition the choice for anglers looking for extra long castability and power. 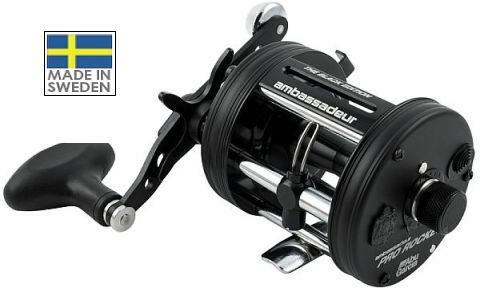 The Ambassadeur CS Pro Rocket is an international best seller. Engineered for super long castability, this model also features a synchronized level wind system for even line lay. The Carbon Matrix. Drag system included in this reel is our strongest and most durable drag system available. The updated extended bend handle with power knob gives anglers an edge by increasing torque and aligning the cranking hand closer to the reel for more efficient fighting power.  2 stainless steel ball bearings + 1 roller bearing provides smooth operation.  Duragear brass gear for extended gear life.  Carbon Matrix. drag system provides smooth, consistent drag pressure across the entire drag range.  4 pin centrifugal brake gives consistent brake pressure throughout the cast.  Extended bent handle with power knobs for increased cranking power.  Synchronized level wind system improves line lay and castability.  Corrosion resistant instant anti reverse bearing provides greater protection. For the purist! The famous free-spinning centrifugally braked distance reel in the range. The Rocket has no Mag brake so the spool just keeps on going and if you can handle the speed, it can almost hit a head-turning 300yds!  The original casting machine.